Something you will regularly see as you travel around Japan in the shines and in public places are Japanese Shinto weddings, or post wedding photography. On the first day of our first trip to Japan we were at Meiji Shrine in Tokyo and saw three wedding parties one after the other. I was fascinated by the customs and particularly the wedding outfits of the women. I needed to know more about these elaborate outfits and formal ceremonies. Of course not all weddings in Japan are in the Shinto tradition, western style weddings have become increasingly popular in modern Japan. Either way the Japanese couple will be already married by the time the ceremony takes place, official documents are filed at a local government office and these must be presented for a ceremony to occur but no ceremony is actually required for the marriage to be legal. The ceremony itself is beautiful and quite complex but this post is specifically about the elaborate wedding outfits so I might come back and post about the other customs later. 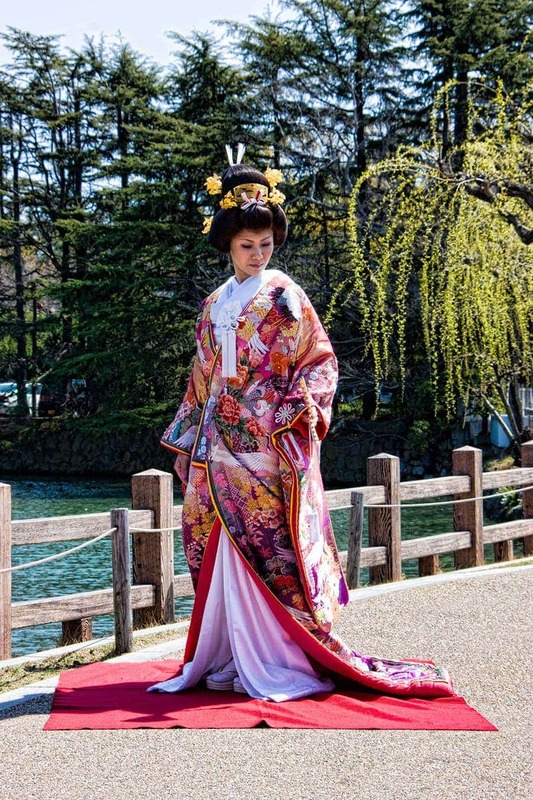 The typical Shinto brides outfit is called the Shiromuku and consists of 6 main parts. These are the white kimono, the over robe called the uchikake, a ceremonial fan, a large white hood called the wataboshi, the tsunokakushi which is the ceremonial headband and an elaborate heavily ornamented hairstyle that is often a wig. The outfit combines styles of two very different eras. The kimono is fashioned on a samurai-class garment of the Edo period while the outer robe takes its design from medieval Japan. A full ensemble, even to hire would cost around $10,000+, not an insignificant expense for the brides family. Not all Shinto brides choose to be married in an all white outfit. When worn with a coloured outer robe it’s called the iro-uchikake (literally coloured robe) and the rest of the pieces remain unchanged. The colours chosen are generally scarlet, orange or gold. 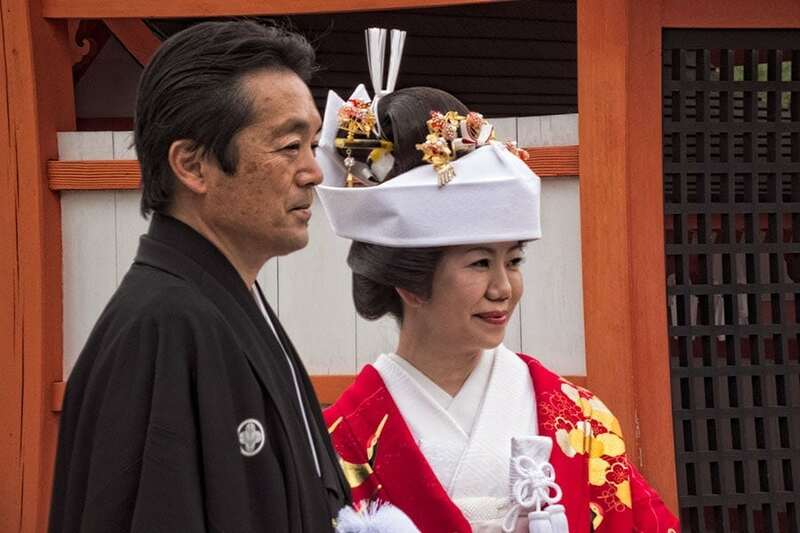 The choice is the brides, while white in the Shinto religion signifies both purity and death it has only come to be associated with weddings over the past century. Not wearing white doesn’t have the same significance as it might for a western bride. 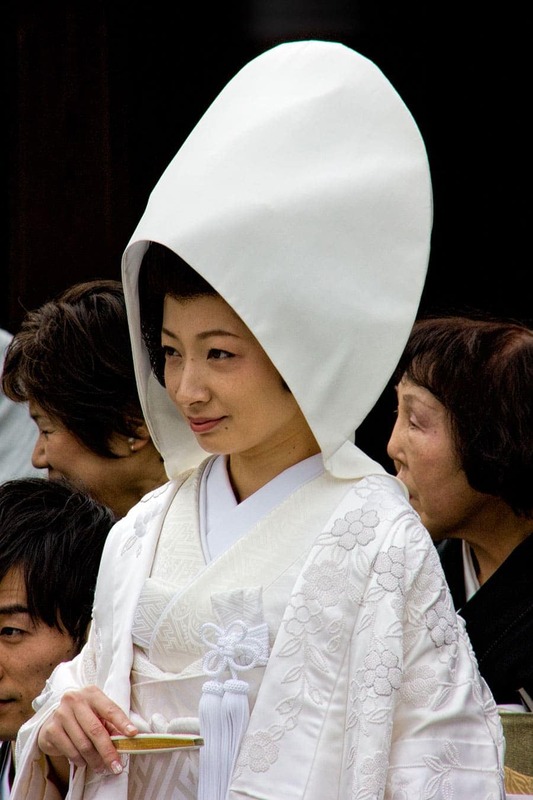 The all white hood called the wataboshi is the Shinto equivalent of the western bridal veil. The bride wears it before and during the ceremony and is a symbol of innocence and purity. The headband is perhaps the most unusual piece for a non-Japanese observer. It is the concealer of horns, a woman is believed to have horns of jealousy which must remain hidden from the prospective husband until after the wedding. The hairstyle as mentioned earlier is usually a wig. It originates from the Edo period (the early 17th to mid 19th centuries) its heavily oiled and twisted in a very specific way. 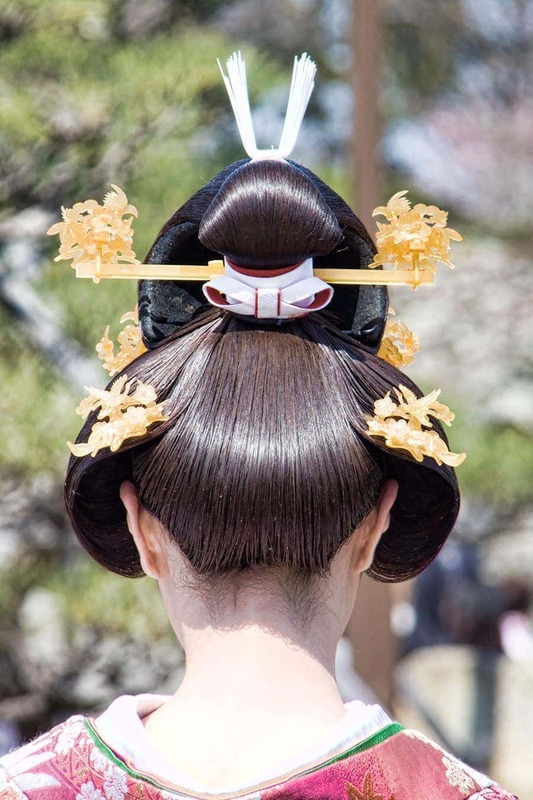 The hair is then decorated with wooden lacquered combs and delicate kanzashi ornaments. 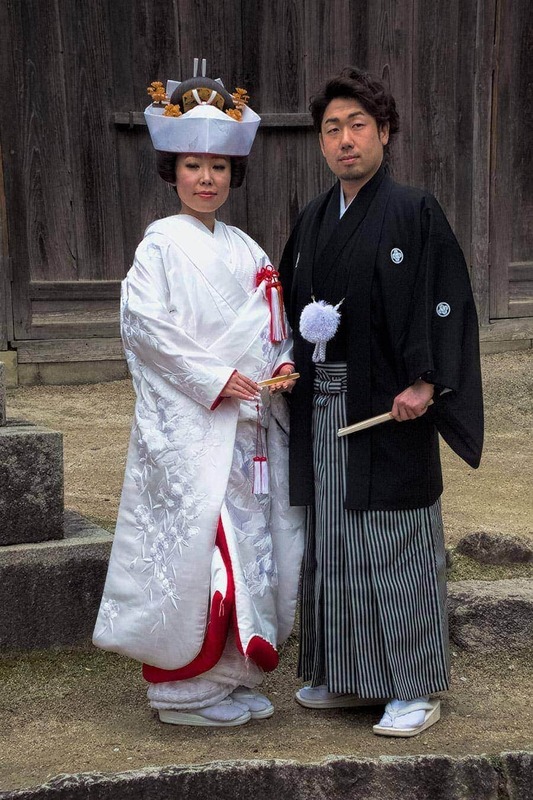 Let me know below if you’ve seen a Shinto wedding or photo session while in Japan? Which style do you prefer, the white or coloured outer robes? Oh my gosh! Japan has been calling me for a long time and this just makes the call stronger. The wedding dresses you’ve shown are exquisite. Absolutely delightful! I haven’t seen any of these before but when I finally get to Japan I will have my eye out for weddings! Due to the layers, do the Japanese tend to marry in the cooler months? Hi Leah, they are so beautiful aren’t they. Japanese seasons are culturally very important, and very pretty in photos so spring and autumn are really popular for weddings. I avoid Japan in the heat of summer but I’m told the brides manage through the heat and humidity in the full wedding kimono with more serenity and less glow than I would muster I’m sure. Thanks for visiting the blog. Such beautiful photos! 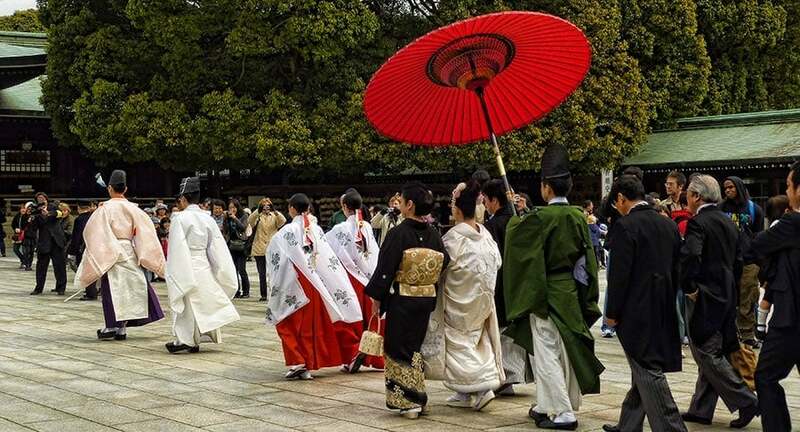 We witnessed a few wedding parties at the Meiji Shrine too a few years ago. It was so fascinating to see the photo sessions and processions. We were there during the summer so it was even more admirable to watch them not break a sweat under all that gear. Thanks for all this useful and interesting information. I never got around to researching about the costumes. So beautiful! I love the white. I haven’t been to a Japenese wedding but I have been to an Indian wedding, also lots of different outfits and layers to the celebration. So cool! I hope I do see a wedding over in Japan. I will try to keep your insights in mind and spot the different layers. I like the coloured outfit best. Did you know that the traditional white European wedding was actually triggered by Queen Victoria’s wedding dress? Before that brides wore all kinds of colours. Thanks Annemarie, I had no idea that our white western gowns started with Queen Victoria, interesting. Wow how beautiful are the outfits…I can see how they could cost upward of $10K. Beautiful photography Toni. The coloured robe is particularly beautiful. I’m fascinated by Asian wedding customs – in many countries a lot of the photography seems to occur before or after the ceremonies. I love how elaborate the Japanese Shinto wedding style is! The third photo is just gorgeous, so much colour compared to traditional Western weddings.